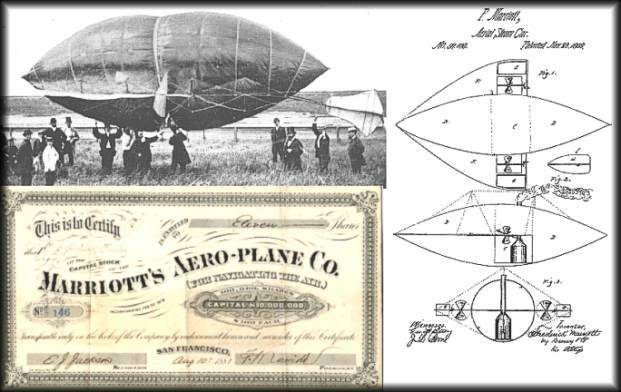 Beautifully engraved RARE certificate from the Marriott's Aero Plane Company issued in 1881. This historic document was printed by the Lith Britton & Rey S.F. and has an ornate border with the company's name across the face. This item is hand signed by Frederick Marriott as president and E.J. Jackson as Secretary. the certiifcate has been folded and has some minor foxing, otherwise in nice condition. This is the first time we have seen this early aviation certificate. Frederick Marriott was born July 16, 1805 in Enfield, England. He departed London in 1850 to seek his fortune in California where he founded the San Francisco News Letter and California Advertiser in 1856. His other publications included Pacific Coast Mining Journal; California China Mail; Flying Dragon; California Mail Bag; and California News Notes. While in England he worked with William S. Henson and John Stringfellow, securing publicity for their aerial efforts, including the Henson Aerial Steam Carriage. Marriott continued to combine his skill as a publicist with his interest in aerial enterprises when he relocated to California. Marriott eventually acquired the funds to raise the Flying Avitor, a twenty-eight foot model steam-driven airship before an enthusiastic crowd in the summer of 1869. On July 2, 1869, at a park across the bay from San Francisco, Frederick Marriott conducted a public test flight of his flying machine. According to reports from the scene the machine actually became airborne, and briefly flew, both with and against the wind. This event is generally considered the first powered flight of a lighter-than-air craft on this side of the Atlantic. Mark Twain mentioned the news event in his letter to the San Francisco Alta California published Aug. 1, 1869. After its first season, the model burned and was never rebuilt. Marriott died on December 16, 1884 at seventy-nine years of age. The Avitor was designed and built under the direction of Frederick Marriott. Built in San Francisco in 1869, the Avitor Hermes, Jr. powered by a 1-hp steam engine driving twin propellers, was the first heavier-than-air aircraft to employ a three-axis control system. A hydrogen gas bag partially offset the weight of the 45 foot airframe, but Avitor's rudimentary 18 foot wings and shape generated the lift that got it off the ground. On its first flight, the unmanned aeroplane flew one mile at a field near the present San Francisco Airport. During later tests, the aeroplane (a term coined by Marriott) caught fire and was destroyed, discouraging Marriott's stockholders and further support of the project. History from Hiller Aviation Institute.